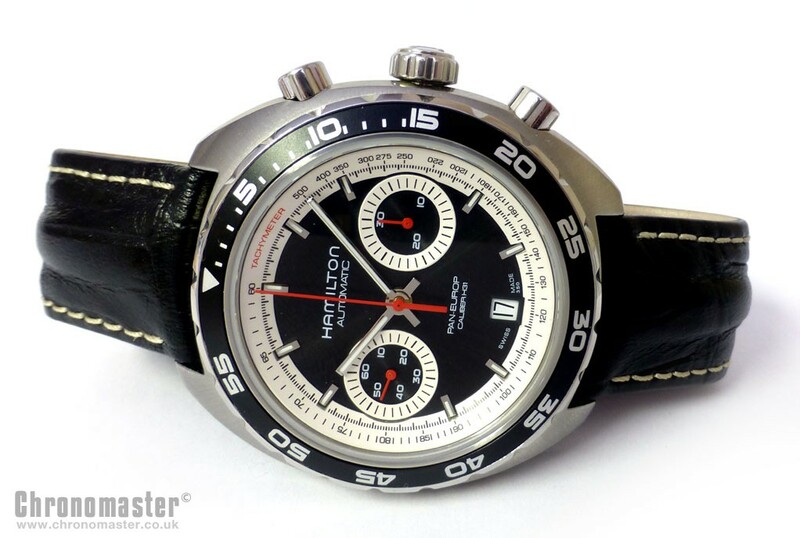 Mint and unworn looking condition Hamilton Pan Europ automatic chronograph. 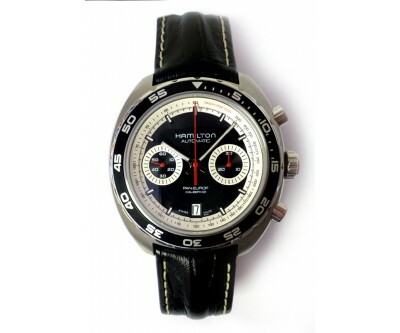 The watch was originally purchased from authorised Hamilton dealers, Hamilton and Inches in May 2012 so just 1 year old when taken into stock with the balance of the warranty remaining on the watch. It comes complete with all boxes and paperwork including guarantee card, date change push pin tool in its own storage bag, and it also comes with a spare case, the case includes the crystal, pushers, crown and rotating bezel. The watch case comes in a Hamilton padded, zippered travel case. 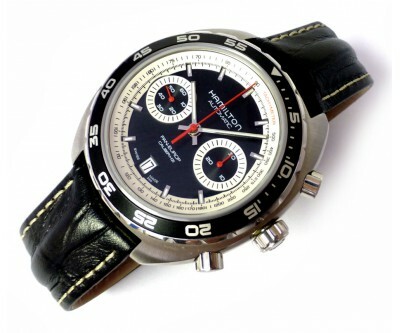 Hamilton are steeped in history and started out as a US company but now owned by Swiss watch making giants, the Swatch group, who own Omega, Tissot and Longines, to name but a few. 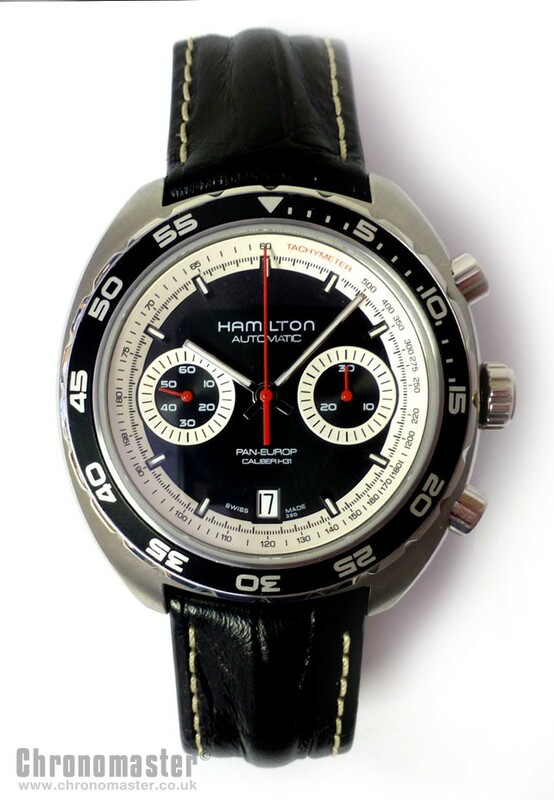 The Hamilton Pan Europ is a recent Hamilton release and has been causing a bit of a sensation in the media and amongst collectors and enthusiasts due to its stunning good looks and retro cool feel to it. 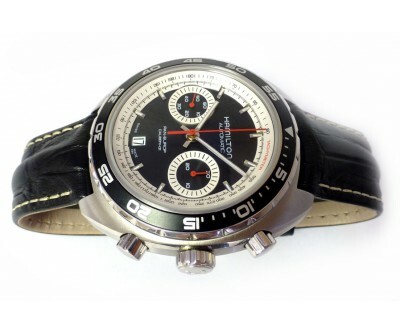 It is an automatic chronograph dedicated to the fascinating theme of changing times. Inspired by a Hamilton timepiece of the same name, originally introduced in 1971, the design of today’s watch takes a nostalgic look over its shoulder, while its functionality celebrates modernity to the full. One of the first automatic chronographs at that time, the Pan Europ is today powered by the caliber H31 with 60 hours power reserve. The watch is neatly dimensioned and a well proportioned watch. 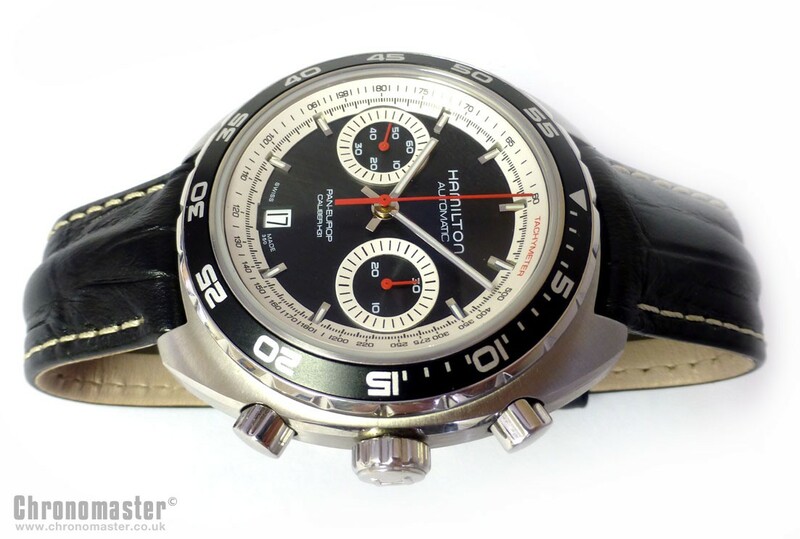 It is a decent sized watch, with black dial dial, white sub dials, and tachometric scale/seconds chapter with red chronograph hands and second hand, making for an overall very handsome colour scheme. 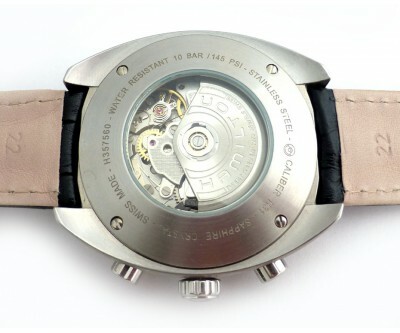 To further complement the colours, it has a rotating ratcheted bezel which is blue with silver numerics and iterations. This colour scheme is perfectly offset by a brown hole punched leather drivers strap. The case is polished stainless steel. 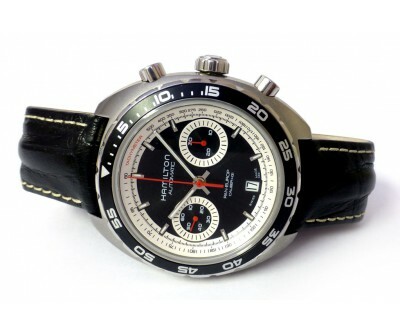 It is 100 metres water resistant. The watch has a date feature at the 6 position, and has a scratch resistant sapphire crystal. Outstanding value for money wristwatch. Excellent condition, but case back has pitting to it. 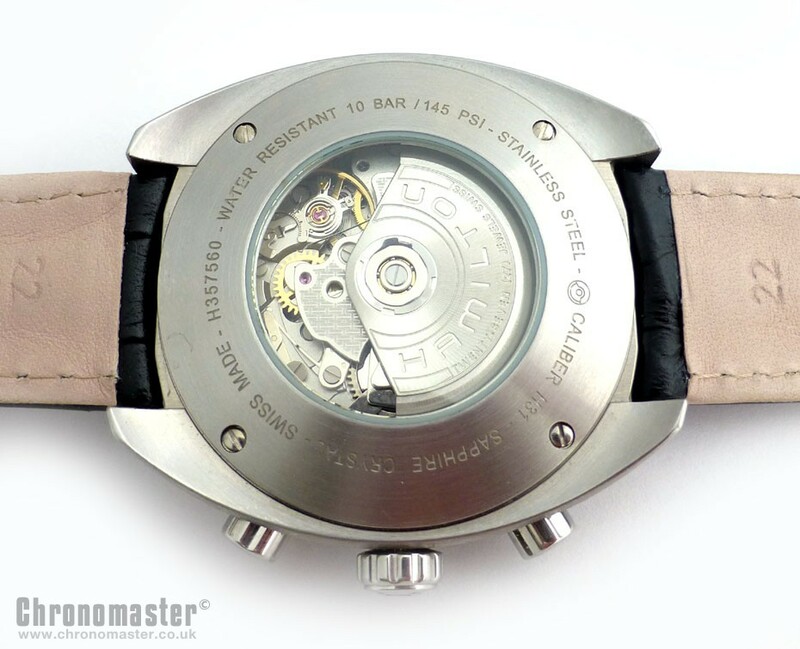 Dimensions are: width 45 excluding crown, 49 mm including crown, lug to lug 49 mm, thickness 14.5 mm.